Return to the video homepage. a. What other kinds of business concepts might Sue Callaway have recognized as a nurse in a hospital? b. Why did Sue Callaway recognize S.C.R.U.B.S. as an opportunity versus other possible opportunities? What roles did environment, experience and mindfulness play? c. What is the business concept for S.C.R.U.B.S.? Demonstrate how it meets the four Cs test. d. What other business concepts might S.C.R.U.B.S. pursue? e. Why would Callaway and Cook decide to take on a business partner? How might they been able to pursue their vision for getting into business without a partner? Go to the video homepage. HATTIE: Join me now for our master class with Sue Callaway, master small business owner. She'll tell you the why behind her company, S.C.R.U.B.S. HATTIE: What I want to know: What makes a scrub, a S.C.R.U.B.? SUE CALLAWAY (Founder, S.C.R.U.B.S. ): The style. HATTIE: OK. But what do you mean? HATTIE: (Voiceover) Sue Callaway was sick and tired of wearing the same old thing to work every day. As an RN, she wore hospital-issued scrubs for years. 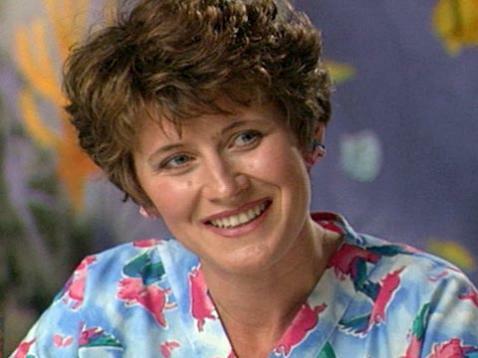 Everything changed for Sue in 1988, when she arrived at work wearing a scrub she had sewed for herself out of a pastel print. SUE: Everyone wondered where I got them. And, of course, I told them I sewed them, and they asked if I could sew them some, too. All my girlfriends wanted them. And I just never said no. I just kept sewing and taking orders. SUE: Simply Comfortable Really Unique Basic Scrubs. HATTIE: (Voiceover) They're made of 100 percent cotton and come in unusual colors and prints. At one time, institutional scrubs came only in white, green or pale blue, and contained polyester. With some imagination, Sue has changed the look and feeling of clothing for millions of health-care workers. Is this a hot seller? SUE: That has been a great seller since the beginning of our business. It's our flying pigs. You can work in real high-stressed areas in the hospital, and sometimes it's just `when pigs fly' I'll get to it. HATTIE: (Voiceover) Located in the Southern California town of Santee, in just five years, S.C.R.U.B.S. has grown to 150 employees who handle sales, customer service and some manufacturing functions, with the sewing outsourced to another small company just a few miles away. So you sewed at home. HATTIE: OK, but, Sue, as a nurse, you probably made pretty nice money if you calculate it per hour. HATTIE: When you calculated what you were making from doing all this sewing, we're talking like babysitting wages, right? SUE: Right, and I wasn't in it for the money. I had my nursing to live on. HATTIE: (Voiceover) Sue's first idea was to sell her products to RNs. Now, every type of health-care worker, including dentists, veterinarians and physicians, is a prospect. Do school teachers buy these clothes? HATTIE: Mm-hmm. What are these called? SUE: These are just a surgical dress. I used to wear these a lot. They're very slimming, and when you bring this around, it creates a nice little pleat on you. Hairdressers like to use them for their models and stuff. HATTIE: When did it first occur to you that this could be a business? SUE: Probably, maybe two years into it we saw that, you know, we could see the orders coming in quicker and more and more people calling. But we really didn't--I was so involved in just the sewing of it that I didn't really focus on the big picture. HATTIE: So I'm thinking of, as a lay person, that those pale green and blue scrubs are cleaner, or can become cleaner. Tell me about color and pastels and prints. I mean, can we--is it sanitary? SUE: Yeah. When I first started in nursing, I had to wear whites. I arrived at work in my street clothes, went into a locker room and changed into scrubs that I wore from there directly to the unit. And if I was to leave the unit, I wore a scrub gown over them to protect them. So they were really concerned with infection control in that environment. And now it's been proven that it boils down to your hand-washing and your contact with patients. So in between your contact with patients, you should be gloving and hand-washing appropriately. SUE: It has been perfect. Definitely. And also, if we didn't have a market where most people had--most of the individual nurses had to buy their own, then we would be selling to hospitals and purchasing departments, and they need to look at money and numbers, and they could never afford a 100 percent cotton scrub. ROCKY COOK (Sue's Husband): She's been sewing all of her life. As a child, she started to sew, and she always wanted to be a nurse and nursing is what she does. And when she started this, it was just because she wanted to feel better about herself going to work, and what it's done is, it's kind of changed the whole light on the industry. I mean, she's created an entire new side of the business that nobody expected to come. HATTIE: (Voiceover) In 1992, Sue's husband, Rocky Cook, convinced her to turn her hobby into a business by partnering with Steve Epstein, a businessman with apparel manufacturing experience. STEVE EPSTEIN (Partner, S.C.R.U.B.S. ): Where are we with the pocket height? If you're gonna lengthen the pant, why is the pocket still in the same position? SUE: Well, he just, you know, made it obvious, or made it known to me, the numbers of health-care workers in the country. STEVE: Also the product is unique, it's different, and it addresses a genuine need in the community. There is a need for something fun in an otherwise morbid business, which health care, to some degree, is. SUE: I was in a narrow little picture, and I needed someone out there who had the global picture. HATTIE: All four of you? ROCKY: All four of us. We turned in vehicles that were paid off--sold vehicles that were paid off and leased vehicles to just gain the monetary gain. ROCKY: Just get the cash, and keep the business going. And this has been kind of a dice roll from the start, and Steve's basic philosophy when we sat down that day was: We want to run this up the flagpole. We don't want to have a business that we all could have right now and make 50 or 100 grand a year. That's not what we want. We want to see if this thing really has the potential to fly, and that's what we've been doing. Every turn has been a very large turn. There's been lots of months we've come up to the edge and said, `OK, here it is. We either make this work or we've gotta go back.' And so there's been lots of those kind of days where we didn't know. But every time that we sent it out and the phones started to ring. Unidentified Employee #1: Thank you for holding. ... How may I help you? HEATHER (Employee): Thank you for calling S.C.R.U.B.S. This is Heather. Can I help you? Unidentified Employee #3: And your next item? SUE: You need to have everyone's expertise, and there's always a partner out there who has a little bit more to offer to the business. HATTIE: And so now apparently the mix is magic. ROCKY: It definitely is. We bring four different pieces to the puzzle, and Sue is, in her creative way and also her personable way, the driving force behind it all. I'm kind of just the--I'm the straw that stirs the drink kind of a deal. Steve is the real business mind. He brought with him computer systems, fabric knowledge, industry knowledge in the garment industry, and Ida, his wife, kind of keeps it together. HATTIE: But she's a personnel specialist. ROCKY: Right. Right. And works in the company also. So I'm liable to be loading the truck one day, the next day dealing with the bank, the following day, you know, stocking the shelves or whatever. I'm kind of a--I move around. I do a lot of stuff. ROCKY: Including laid all the carpet in the building. HATTIE: All right. So you were willing to give up half of your business. SUE: Mm-hmm. Yes, I was willing to give up half because I could see where it would grow, you know. Steve had sat down and did a projection, just a real basic, not very exaggerated or--what's the word? SUE: Yeah, a very realistic projection, and it was beyond anything that I could even imagine. STEVE: Well, I think the company works because it has very sound fundamentals. We are extremely quality conscious. We don't take any shortcuts when it comes to quality. We are very customer service conscious, to the excess, probably. We provide guarantees and things to the customer that make the purchase totally non-risk to them. Lightbulb HATTIE: (In the studio) Timing is everything. Two events converged to make the timing perfect for Sue's success. First, new research shows that germs are not transported on clothing but on the hands. Therefore, uniforms don't have to be laundered at extremely high temperatures which would fade bright colors quickly. Second, cost-cutting in hospitals. For years, hospital purchasing agents bought uniforms in solid colors with a cotton-polyester blend. The polyester gives the uniforms a longer life, and the blends are cheaper than the 100 percent cotton fabrics used by S.C.R.U.B.S. Today, many health-care professionals have to purchase their own uniforms, so it makes sense that they might want to choose the colors, prints and fabrics. Sue was in the middle of the health-care revolution and she wasn't asleep. You may be working in an industry which is going through dramatic change. Can you harness the change to your own advantage? Can you deliver, as Sue has, the right product at the right time? It's been said that you can make your own timing. However, it makes a lot more sense to build a business with the timing of the market on your side.